New captain Tom Harris led his team to a 3-1 success over Chapeltown in their first outing, before the Ainsty Road outfit played out a 1-1 with Neston South Wirral. ‘Gate shot out of the blocks in their North Division One season-opener at home to Chapeltown and could have been ahead inside a minute, only a last-ditch block denying Harry Henderson what would have been the quickest goal in the club’s history. The hosts continued to exert pressure and were rewarded after four minutes. Charles Edmondson’s cross was charged down but with the ball loose in the ‘D’, Will Rogers pounced to slot in at the near post. ‘Gate continued to have the better of the play but some resolute defending from the away side kept the score at 1-0 until the final minute of the half when, against the run of play, Chapeltown won and dispatched a short-corner. 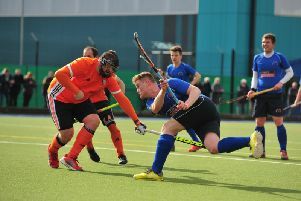 Harris’ men were back in control after the break and Joe Horne, on his return to the club following three years at Sheffield Hallam University, dispossessed a visting defender then played an intelligent one-two with Edmondson that left him an easy finish. The home side’s tails were up and a marauding run and pin-point cross from Graeme Bevington found Rogers at the back post, where he finished smartly to wrap things up. Reflecting on his team’s success, Harris said: “We are obviously pleased to get the three points. “We started fast and the early goal helped to dispel any early-season nerves. On the road at Neston on Saturday, ‘Gate started the brighter of the two teams and had their hosts on the back foot for long periods of the first period. It was however the home team who drew first blood, a rapid counter-attack down leading to the deadlock being broken. Neston’s joy was short lived though as ‘Gate demonstrated their own counter-attacking prowess. Some quick passing between Bevington and Edmondson led to captain Harris skipper Tom Harris being found unmarked in the ‘D’. The Neston goalkeeper got out well to smother his first attempt, but Harris was able to pick out striker Horne on the back post to convert to make the game 1-1 at half time. The second half was a much more cagey affair with both sides enjoying periods of dominance. A last minute short -corner provided Neston with the chance to grab all three points, however returning goalkeeper Rob Stanworth made a fine save to keep thescore at 1-1 and earn the visitors a point. Harrogate Ladies 1s got the new campaign underway with a 4-1 loss at Chester, but bounced back on Saturday. They defeated Wakefield 2s by a 3-1 scoreline at Granby and travel to bottom side Bowdon 2s this weekend.